Jerusalem (AFP) - Israel's military has suggested that a photo it has distributed shows journalists are willingly being used as human shields by Palestinian militants during recent protests, but video and a witness account of the incident tell a different story. The military has made a photo from April 13 protests and clashes on the Gaza Strip border part of its public relations effort, with one army spokesman using it in a tweet to suggest bias and recklessness by journalists covering recent demonstrations. Those suggestions conflict with video footage of the incident shown in the photograph filmed by an AFP journalist and the reporter's description of what happened. The distribution of the photo comes as Israel comes under scrutiny over its use of live fire during protests and clashes on the Gaza border. Thirty-four Palestinians have been killed and hundreds wounded by Israeli forces since the protests began on March 30, according to Gaza's health ministry. The dead include a Palestinian journalist who witnesses said was wearing a press vest when he was shot. Israel accuses Hamas, the Islamist movement that runs the Gaza Strip and with whom it has fought three wars since 2008, of using the protests as cover to carry out violence and says it has only opened fire when necessary. There have been no Israeli casualties, and Palestinians say protesters are being shot while posing no threat to troops. 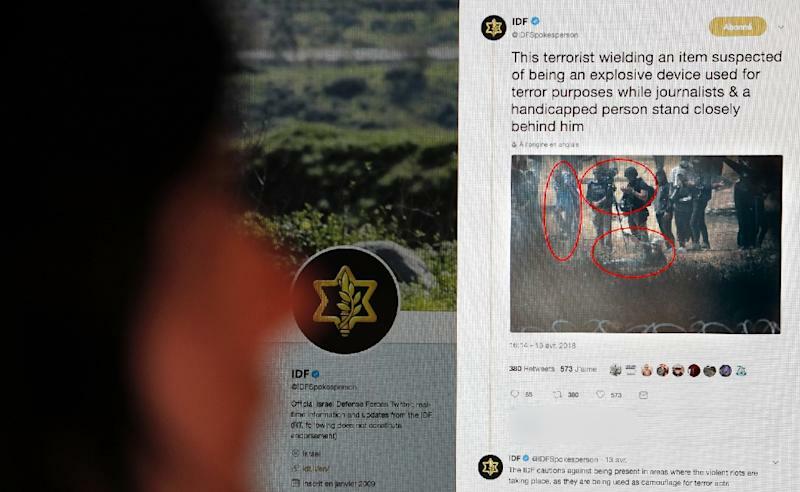 When first distributing the photo on April 13, Israel's military said the main person in it was "a terrorist wielding an item suspected of being an explosive device used for terror purposes while journalists and a handicapped person stand closely behind him." "Once again, the IDF (Israel Defence Forces) cautions against being present in areas where the violent riots are taking place, as they are being used as camouflage for terror acts targeting Israel's security infrastructure and IDF troops." The military's Arabic-language spokesman Avichay Adraee took it further, tweeting the photo to his 190,000 followers with fake dialogue written next to the people in it, including an AFP video journalist. Dialogue next to the AFP journalist says: "I came alone, but I don't care if I am used as a human shield. If something happens, we'll accuse Israel." The AFP journalist recorded video of the incident shown in the photograph during protests east of Gaza City. Footage shows a man wearing a keffiyeh scarf attempting and failing to light what seems to be a standard firework while lying on the ground amid black smoke from burning tyres. He was at least 100 metres from Israeli forces at the time, the journalist said, and later gave up and left the area. The journalist, who has extensive experience in conflict zones, had positioned himself and his camera there in part because he believed he was far enough from the border fence to avoid unnecessary risk. AFP has not been able to identify the person in the photo and video and it is not clear what he did before or after the footage was recorded. In response to questions from AFP, Israel's military said "these types of explosive devices were hurled over the security fence along the Gaza border several times during the violent riots in an effort to harm IDF troops. "As for the related tweet, the content was posted to illustrate the dangerous and complex situation journalists and civilians put themselves in when they choose to be present in the violent riots organised by the Hamas terror organisation. "The illustration was not intended to specifically or personally target the journalist pictured." Protests began on the Gaza-Israel border on March 30 and are planned to last six weeks in the blockaded enclave. Tens of thousands have participated, while a smaller number have approached the fence and thrown stones and rolled burning tyres toward soldiers. It has pledged to stop attacks, damage to the fence and infiltration bids, and alleges there have been attempts at all three. The European Union and UN chief Antonio Guterres have called for an independent investigation into the deaths, but Israel has rejected it. It says its open-fire rules are necessary to defend the border. Defence Minister Avigdor Lieberman has alleged the journalist who was killed on April 6, Yasser Murtaja, had been a paid member of Hamas's armed wing. The company Murtaja co-founded had however been vetted for US government funding, while an international journalists federation said he was harassed and beaten by Hamas police in 2015. Israel has not said whether Murtaja was shot on purpose or by accident.